There is new evidence to support the hypothesis that all stars are "born" with at least one "sibling" — including our sun. Why it matters: "Our work is a step forward in understanding both how binaries form and also the role that binaries play in early stellar evolution," said UC Berkeley astronomer Steven Stahler. The two or three stars that are commonly found at the center of planetary systems fall into place together after they form. 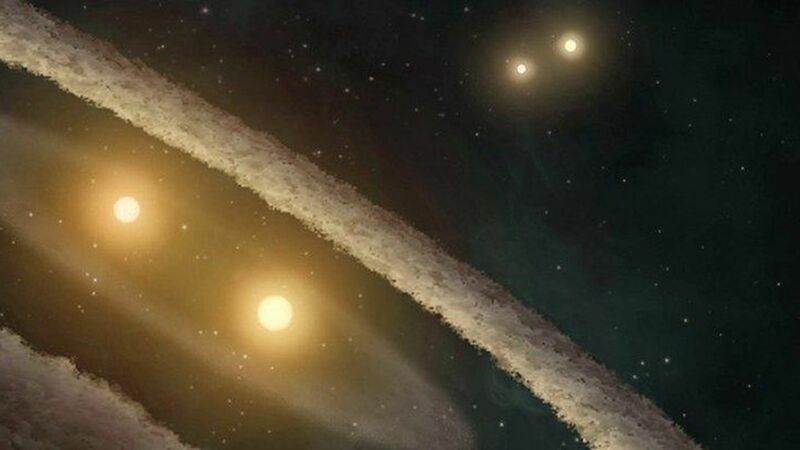 The stars at the center of a planetary system are "born" together as "siblings" — this is the favored hypothesis, and the one the new study supports. The finding: Scientists looked at data from a dust cloud's radio waves in the Perseus constellation that had a host of baby stars. They found that the younger class of stars were closer to their "partners," while some drifted apart as they got older. The scientists then created several simulations of different ways the stars could form. The model that had stars and their twins forming at the same time produced numbers closest to what is observed. Throwback: Since the 80s, people have speculated that the sun used to have a twin star that shared the center of our universe, even going so far as to name it "Nemesis" and blame it for the extinction of the dinosaurs.